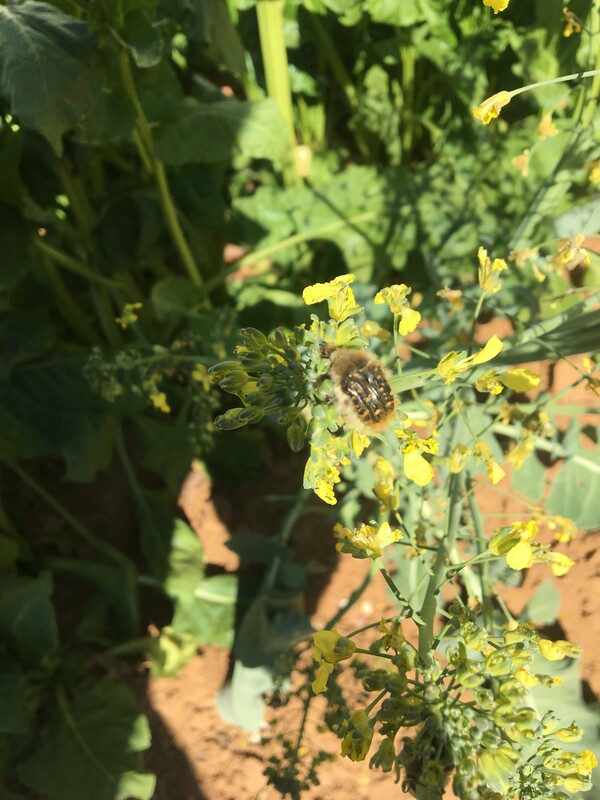 Do you recognize these flying insects that seem to enjoy broccoli flowers? I have several almond trees around, and bees are busy these days but I'm not sure these particular insects are of any benefit. I'm in the mediterranean, north of Africa. It is a species of scarab beetle. It looks very much like "Tropinota hirta" (hirta means hairy) which is quite common in the Mediterranean region, but might also be Tropinota squalida. They are fruit crop pests and, as a general group, are also known as "chafers". Another common name for this pest is "apple blossom beetle". They are probably most attracted to your Almond trees. Below are a few links that may lead you to further information. Not the answer you're looking for? Browse other questions tagged bugs bug-identification or ask your own question. Eating Matches to repel insects? Stop insects from flying into my cooldrink? Is there an easy way to tell if a bee in my yard is being raised in a hive (domestic), or if it's wild (feral)? Why does burning dung drive away insects?